The Embroidery Design is on page 2 of your pattern instructions. Get it out and look at it. Starch and Press your Dress Front (do not press over tape on wrong side). Fold Daygown Front together and crease Center Front all the way down to the hem. Read Step 2 for more instruction. 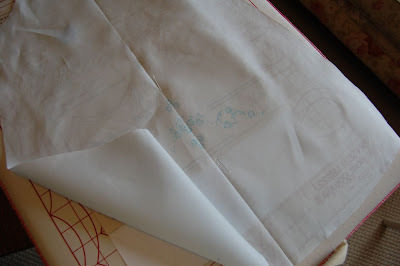 There are different ways to transfer embroidery designs onto fabric. I am showing you how I will transfer the embroidery design using this pattern and this embroidery design. Link for Lesson on Transferring Embroidery Design Here! Read the entire Lesson even if you don't think it applies to you. Then come back to this lesson and continue. Read all instruction in this Post about the Embroidery before beginning your work. I have my design pinned to a Fabric Board. An ironing board can work as well. Or, gently tape the design to the table so it will not move. Place a piece of white computer paper under the page with the embroidery design on it. It will help make the design more visible. 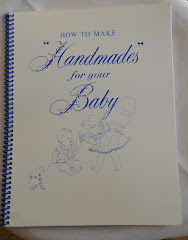 I did not have any problem seeing the design through my blue Satin Batiste fabric. 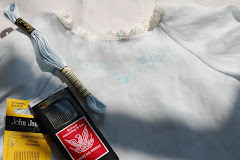 I am making my Daygown for a Boy Baby and although the embroidery design is elaborate, it is suitable for a boy. To make the Daygown less fancy, just leave off the hem embroidery. I am measuring 6 3/4" above the hem for the right side of the hem design. I will measure the left side of the design too. I want to make sure the design is even on both sides of the daygown hem area. The instructions for the Hem embroidery design tell you to place the lowest part of the embroidery design 6 3/4" above raw hem edge. It is important to measure for each side. We will not embroider this lesson. Set the fabric aside after tracing embroidery design. Now go back and transfer your Embroidery Design. Then come back for the MAJOR part of this Lesson. 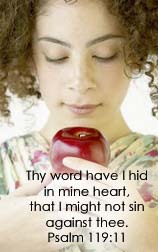 Question for Lesson Two - Where do you live? Which State if in the USA. Please post comment at the end of this Lesson on this Post. 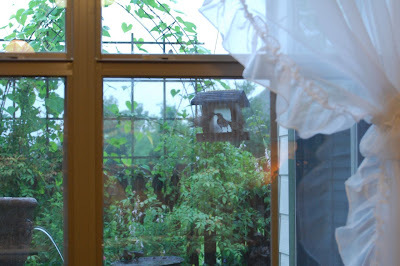 It is raining this morning. Perfect sewing weather. It feels nice to just look out the window at the rain. I down loaded some Joshua Bell music "Romance of the Violin" to listen to. Perfect music for Handmade Buttonholes! 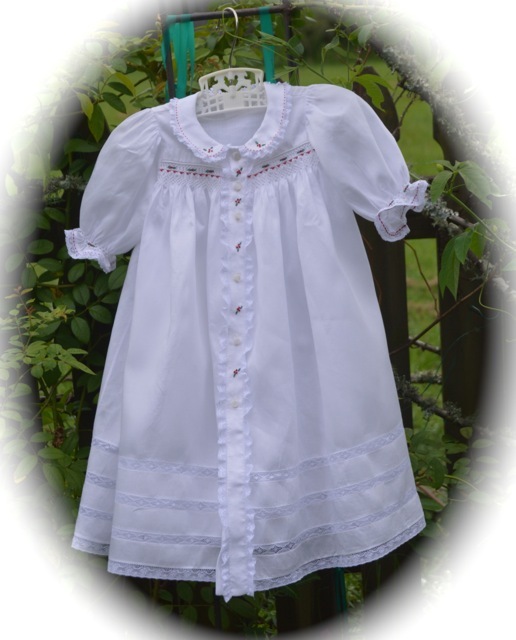 Most of the old Baby Clothes were made by hand and even the old Baby Clothes that were made by machine had Handmade buttonholes in them. There was a practical reason for this. The sewing machines did not make pretty little button holes. Today our sewing machines can make lovely buttonholes. There is no shame in putting machine made buttonholes in your little Daygown. Having said that, I REALLY want you to stitch at least a couple by hand on a practice fabric. Your dress is not entirely made by hand if you use the machine for buttonholes. Machine Stitched Buttonholes: Use a very light weight stabilizer under the fabric. I use plain old tissue paper. Use DMC #50, Mettler #60 Mettler Silk Finish #50 cotton thread (top and bobbin). Sewing your Buttonhole will depend on your Sewing Machine and you will need to refer to your Machine manual or your local Sewing Machine Dealer. Usually the top tension is tightened , sometimes the machine does this automaticly. Click Here For Handmade Buttonholes. Then come back here! I was a little late this morning because I baked a cake for you! It is my goal to get the Lesson up by 9 am on Friday! Today, we are having homemade Chocolate cake and Pomegranet Green Tea. 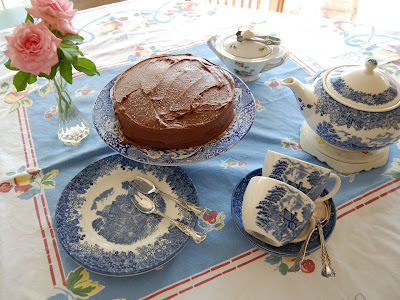 Using my Wedgewood "Romantic England" blue and white China. Yum! And we can watch the birds play! Romantic Birds too! I have a theme going here! 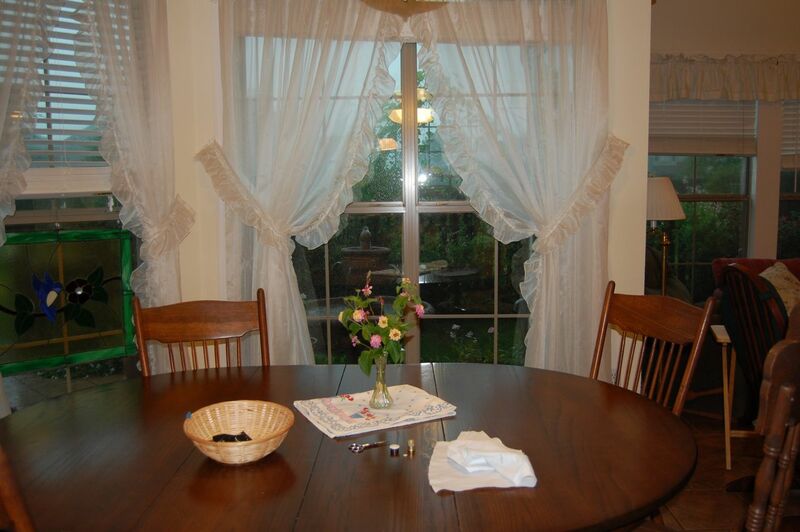 I want windows like that!!!!!! The cake looks yummy!! THANKS!!! Hi Jeannie! I live in Tinley Park, IL (south suburbs of Chicago). Hi everyone! I live in Bastrop, Louisiana...small town in northeast Louisiana. Hi Jeannie! I'm stitching along in Rockwall, Texas, just east of Dallas. I live in North Georgia. Karin is stitching along from New Jersey...the Garden State. I curreently am in south/central NJ, about 25 minutes from Philadelphia...home of Liberty and Independence. Someday, Jeannie, we will have these lessons in Victorian Cape May...you will love it there. Love the lessons! Hello Everyone. I am stitching along in Plano TX, north of Dallas. I am in east central Alabama - near Auburn Alabama. 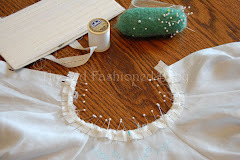 I can't tell you how much fun I am having hand stitching this sweet little daygown!!! I am stitching in Alabama. I'm in Montgomery, AL. I'd like some of your rain please. Cake would be nice too. Hello, I finally figured out how to leave a comment! I am stitching from Claremont, California. Hi Jeannie! I am stitching in St. Petersburg, Florida. Actually, I am using today to catch up. I received the gown pattern from you on Monday and have prepared my fabric (white cotton lawn). I was both hoping and a little afraid that this week's lesson would be handmade buttonholes. I've done them before but have never been satisfied with my work. I really hate machine buttonholes on fine baby things so these will be handmade (and hopefully much better than my previous ones)! Thank you for all the detailed steps in your lessons! Sending cool breezes & sunshine from Southern California to all ~ from Laguna Niguel (Orange County)~ a perfect day for sewing! I live in Hot Springs, Arkansas and today the rain has fallen,and I rejoice in God's perfect timing! 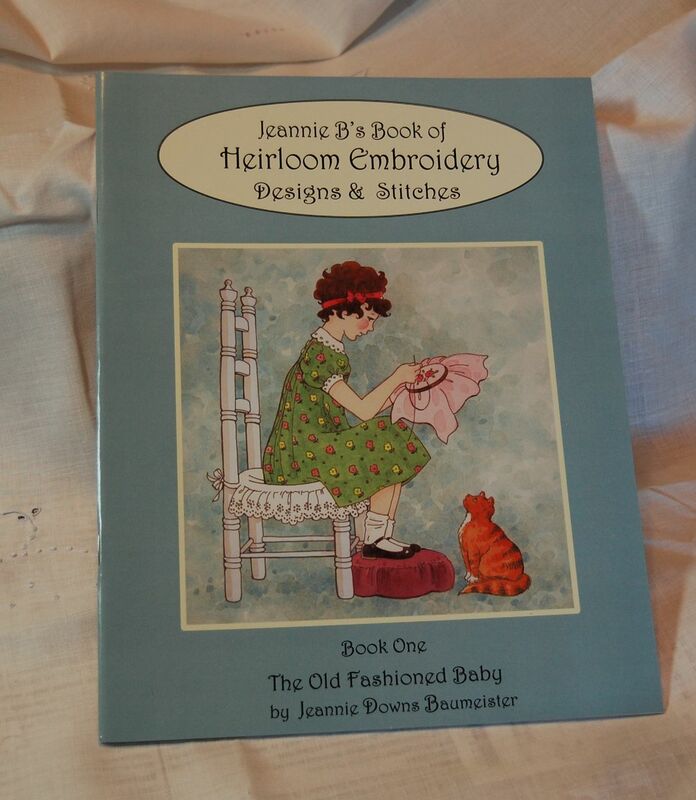 I can't wait to get started on this lesson and my buttonholes, plus embroidery design. I am actually not behind!!! Hi Jeannie: I live in northern Mississippi. Love the Sew Along and that cake looks so good! Thanks so much for all your hard work! I am in Highland Village, a suburb north of Dallas, Tx. Wish it was raining, except with our heat it would just be steamy. The cake looks yummy. Hope I don't get chocolate icing on my little white daygown! I won't be checking in until this time every Friday, hope that's ok. It's a beautiful day in Michigan. I won't be able to sew along until this time every Friday, I hope that's ok. This is my first class with you and I'm really looking forward to it. Thank you for doing this sew along! Oh, yum...Thank you for the lovely cake and view! I'm stitching in Michigan with my teenage daughter...See who posts first.lol. I live in Michigain. Your china is so so so kawaii(cute)!!!!!! Mama said I should mention that I'm learning Japanese, just to make the kawaii less random. The cake looks very tasty too...maybe the birds are stalking the cake!?!? I happen to be the teenage daughter that Wendy(Mama) mentioned sewing along with. I'm stitching from Naples, FL. Quick question...are the buttonholes supposed to be vertical or horizontal? The pattern shows vertical but your photos are showing horizontal. And if it matters, why? Hi Jeannie. I live in Georgia. Thanks for the cake!!! I am just beginning so am a little behind. My sweet husband brought me a new light box so I will be tracing my embroidery here in Texas. Such fun. I don't yet know if I will tackle hand buttonholes but may try one on a sample. Thanks for the lessons. 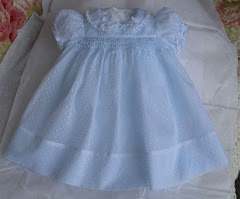 Also, I am making this little gown for the daughter of a friend. I am stitching in Wilmington, Delaware. That chocolate ake looks yummy! I just finished sewing the buttonholes by machine, sorry, but I promise I'll try a couple of hand-made ones on some scraps! I've never done that before. This fabric is so fun to work with, I love it. I see more satin batiste in my future! Answer to Virginia: The buttonholes are vertical like the pattern shows. 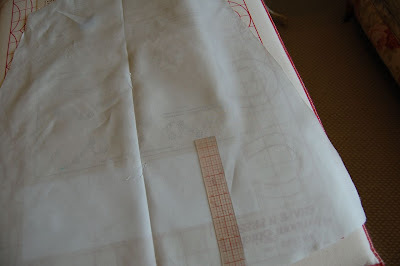 You need to turn the fabric when stitching them so the picture might show them side ways. The direction of the buttonhole can make a difference so it is best to follow the pattern directions. In the case of this Daygown, there would not be enough fabric on either side of the buttonhole for stability if they were horizontal. And the buttons would be off center as they pulled to the edge of the buttonhole. 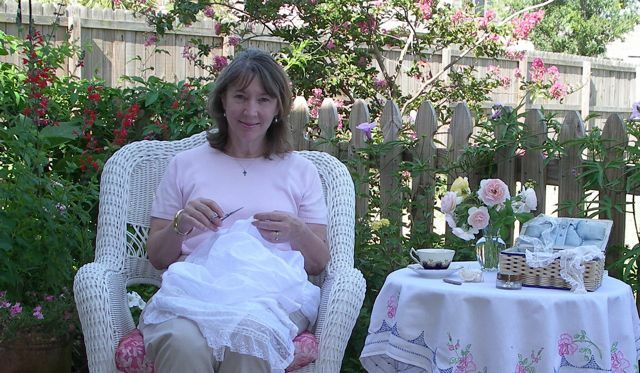 I am sewing in Daphne, Alabama which is on the Eastern Shores of the Mobile Bay. It is HOT,HOT,HOT, and a lot of STEAMY!!! The chocolate cake looks scrumptious!!! Thank You for all your time with this sew-a-long!! I'm ready to start lesson 2 and I'm going to attempt buttonholes by hand, just to say I did it. 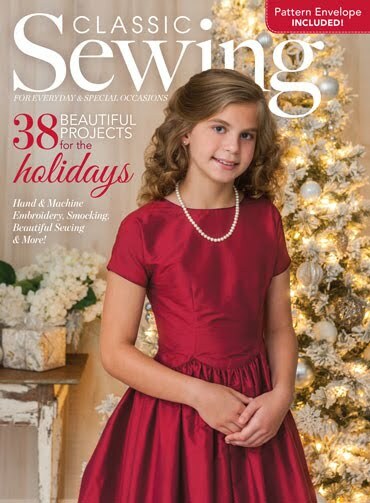 I'm writing about my experience in the Sew Along. It's great that so many ladies are participating! My question: I am making this for my baby boy. I'm using blue satin batiste and I'm still hung up on the embroidery looking "girly". I found a design by you in CN Nov/Dec 98 (p.22) Do you think I could substitute that one? Thanks Jeannie! That clears it up for me. Now that I look again, I see I was confused when looking at the picture. Can't wait to get going. I'm up the road from you, Jeannie, in Baton Rouge. You are welcome to use another embroidery design if you would like. Answer to dlogan: Well, I starch really well before I mark my fabric but I have marked and then starched and I press over mine. But I will not tell you the blue will always come out. Just that I have not had a problem with it. You can be safe and starch, mark, sew and carefully rinse it out before continuing. But be careful you don't fray the unfinished edges of the daygown. I use 18" to 20" of thread or floss or what ever I am using. Sewing from Talladega, Alabama. Sorry I'm late - last minute trip to the beach before school starts. What color do you recommend to embroider on light blue? I'm from NE Florida. I am a little behind on my stitching because I'm out of town helping my daughter who just had a baby. As soon as I get home, I will be catching up on my daygown! Hi, I'm in beautiful SE OK. The town I live in has the World's Highest Hill!! It rained this morning! Thank you God! Love this sew along. I'm behind. In fact I haven't started yet, but don't give up on me. I'll get there! I live in Stoughton, WI but am in Orlando right now for my oldest daughter's college graduation. I never tried handmade buttonholes before but I loved doing these! Mine are very, very far from perfect but the look is so much lighter than machine ones and I avoid the terror of knowing that if my machine goes all fussybludget on a buttonhole, it will be almost impossible to unstitch or fix. Thank you for giving me the courage to try these! Thanks for the yummy looking cake! I am stitching along from Mayer, Minnesota (a little town about 45 southwest of the Twin Cities). 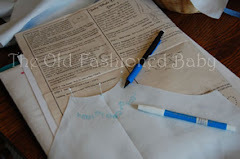 I can't wait to try the hand buttonholes...I have not been pleased with how my machine works buttonholes on the fine fabric I use for heirloom sewing, so may this will be my new method! I'm stitching in Irvine, California. 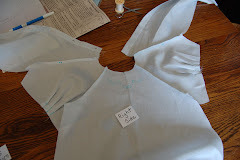 My fabric for this daygown (and might have enough fabric for a matching bonnet) is off-white, sort of a pale ivory/ecru. Any floss color suggestions? Answer to Pandy: I don't use a hoop for the stitches on this embroidery design so I cut the pattern out first and then embroider. If you were to use a hoop, you would need to trace the pattern onto your fabric, and the embroidery design too. Then embroider and then cut out the garment. I am going to do the embroidery after the garment is finished and will not use a hoop. 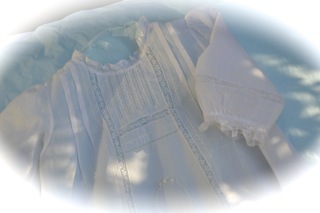 Answer to Embroidery Floss colors: I am doing my blue daygown in a blue that matches. It will be all one color. I like tone on tone. It could also match the lace - ecru for ecru lace or white for white lace. And you can always use colors. Green for stem and leaves and blue or pink for flowers. Choices , choices! Hi, Jeannie. I am practicing my buttonholes and have a question: Do you wax your thread for buttonhole stitching? Thanks! Jeannie...I stitched my buttonholes today and although they aren't perfect it was a great challenge and I enjoyed it. My question is this: After I finished them I wondered if I should have waxed my thread? Do you personally wax your thread when you stitch the buttonholes by hand? Thanks so much!!! OOPS! forgot to say where I live. 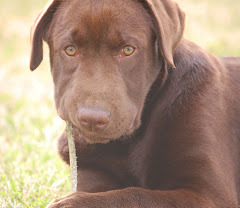 I am from Dothan, Alabama, about an hour from the gulf coast beaches. I love being able to run away to the beach even if it's only for the day!!!! I missed the first two lessons, but I am busy catching up! I live in Rheinfelden, Germany which is right on the border between Germany and Switzerland. I've been on vacation, so I have some catching up to do. I live in Overland Park, Kansas. 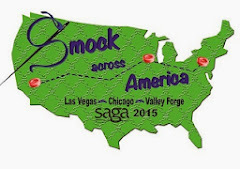 I am Norfolk, VA, home of the 2010 SAGA convention. Your room awaits you dear friend. I can not wait!! Your class will all get a special treat...just because you will be in it!! I am stitching in Iowa. Just received my pattern before we left town for a long weekend. Will be playing catch up this week.